These are some of the Charitable Organizations whom we are involved with in 2018. Our members are involved with numerous other local and regional charities and volunteer positions. 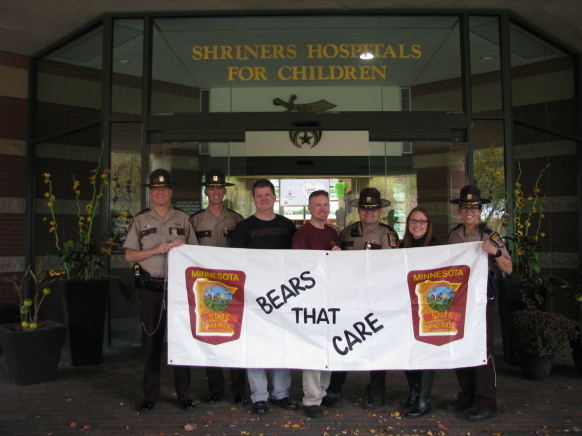 Bears That Care was started in 1987 as a way to give back to the community through a Christmas time program. It has grown into a registered 501 (c) 3 charity and is wholly operated by the Minnesota State Patrol. Bears That Care now makes two trips a year to Twin Cities hospitals near Easter and Halloween time. We visit the University of Minnesota Masonic Children’s Hospital and the Shriners Hospitals for Children. At each hospital uniformed troopers and other personnel pass out goody bags full of: toys, stuffed animals, coloring books and crayons. The uniformed state troopers are accompanied by troopers that volunteer to wear the costumes of Smokey Bear and McGruff the Crime Dog. Photos are taken of the children receiving their goody bags. At the Shriners Hospital the photos are stickers and are given to the children right away. The majority of our funding comes from the Minnesota State Patrol Troopers Association. we have our own web site where there is more information and photos too. officers. Don always had a vision of being able to provide some sort of lodging for law enforcement families visiting the Mayo Clinic. Through Don’s tireless efforts, that vision became a reality in 2008 when the original “House of Shields” opened its doors. Don was able to find and secure lodging that law enforcement officers visiting the Mayo Clinic could use at no cost. We all know how expensive medical care is today and that is compounded when one has to travel long distances to receive needed care. Don made arrangements with a local property manager, Allman & Associates, for access to three apartments, close to Mayo, which are only available to law enforcement officers and their family members. These apartments make the costs of out of town medical care less of a concern for a fellow officer in a time of crisis. The apartments are fully furnished and provided at absolutely no cost to officers and their family members for long or short term stays. Furthermore, this lodging is not limited to Minnesota law enforcement officers, it is available to officers from anywhere. Many officers from other countries have utilized the apartments which are paid for via private donations and through the Rochester Police Benevolent Association and the Olmsted County Deputy Sheriff s Association. Major donors include the Minnesota State Patrol Troopers Association, The St. Paul Police Federation and Kwik Trip, Inc. Since its inception, the “House of Shields” has served nearly 400 families and are fully occupied on most days. Additionally, Officer Bray and the “House of Shields” are looking to the future and hoping to expand the amount of lodging offered to those visiting Mayo by increasing the number of rooms available to officers in need.